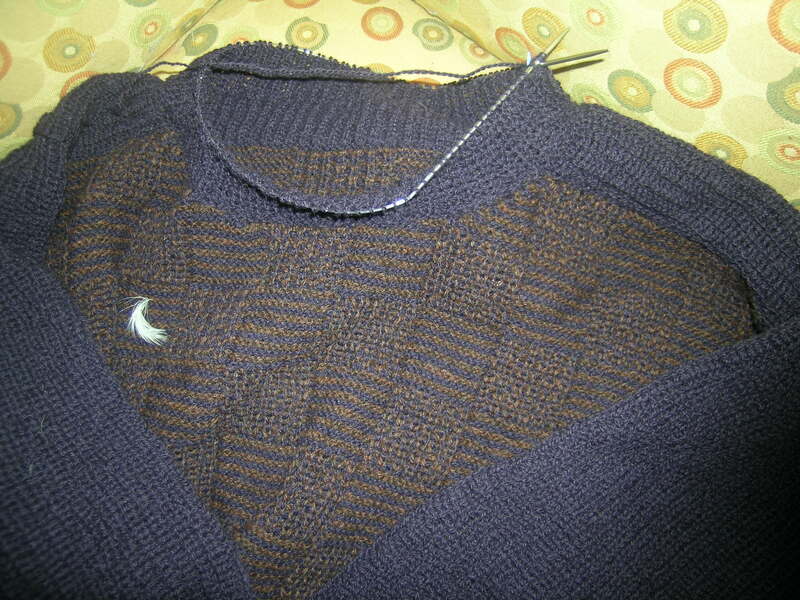 Then all I had to do was the collar, which as usual took longer than planned. 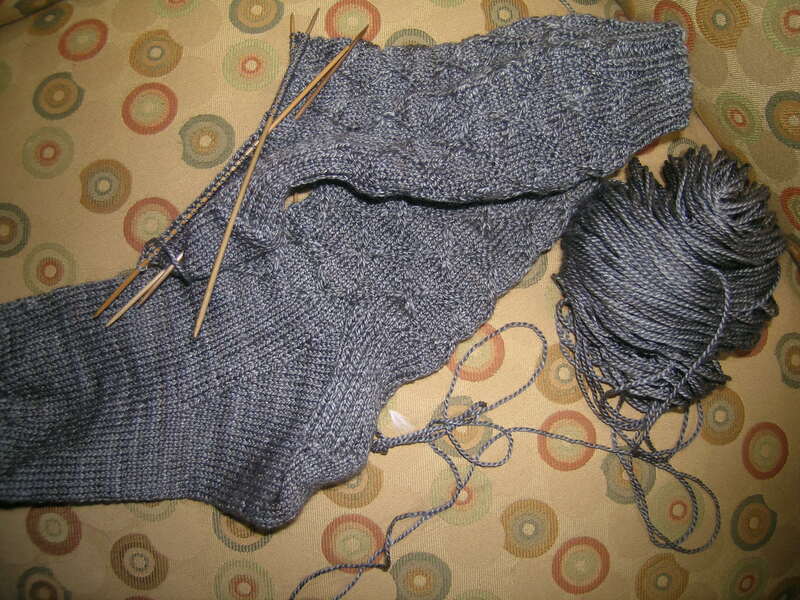 This is the Chess sweater, a kit by Hanne Falkenberg, and a ton of knitting with size 2 needles. This is as far as I got, it was put in a box with the needles still attached. Hopefully this will get finished today. Since his stocking was also on the light side, I decided that I needed to put in a pair of socks. I had been working on these from the CookieA sock club, the pattern is Hex Socks. The first one I started 4 times, Medium, then Large, then Small, then back to Medium. The yarn is from Fleece Artist and it is Sea Wool (70% Merino, and 30% Seacell), a bit thicker knitted up than I usually like for my socks. The idea behind SeaCell® is really rather simple: a cellulose-based fiber is manufactured using the so-called Lyocell process. This Lyocell fiber then serves as the “functioning substrate” for the seaweed. Seaweed is added as the active substance for a very good reason. The fact that this marine plant is rich in trace elements has been well known since the times of Chinese medicine, and seaweed has also been proved to protect the skin and have anti-inflammatory properties. It is seaweed which forms the basis of the SeaCell® fiber. So, I put one sock in the stocking, and kept working on the second. 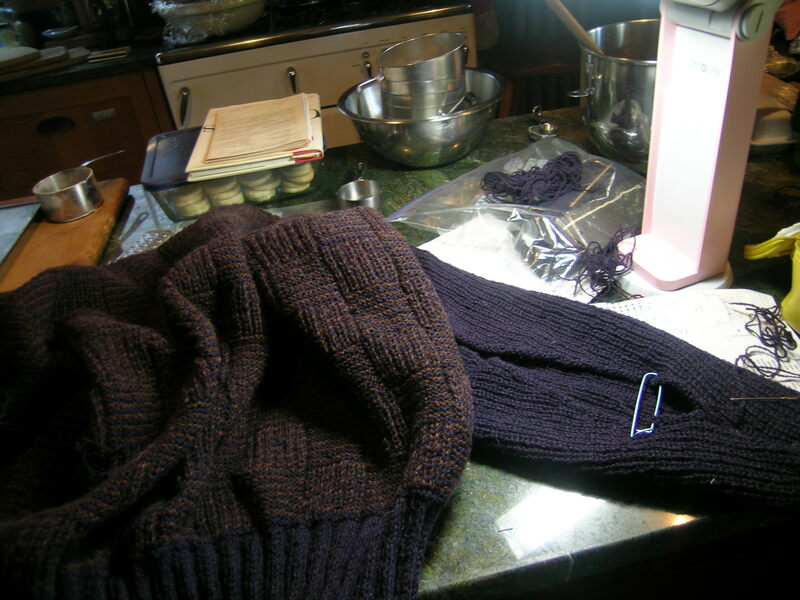 Then, I burned my hand twice in the oven while cooking yesterday, so I had to soak my fingers on ice, knit a partial round on the sock, soak my fingers, knit a bit, etc. Not the most productive. Today I am better, and hope to get these done. I hope you all had a very Merry Christmas! We did! I love the socks. The color and pattern are both very attractive & I would think that the quality of the yarn will be great if your hubby is on his feet a lot or his feet get irritated easily. The sweater is gorgeous–I bet it will look great on Dan. Of course, I know he loves your socks!